The Chipotle Mexican Grill Inc. (NYSE: CMG) stock price rebounded today (Friday) after the company reopened a restaurant in Billerica, Mass., that was temporarily closed after a norovirus outbreak on Tuesday. The CMG stock price fell nearly 5% on Tuesday after the news broke, and is down nearly 3% for the week. 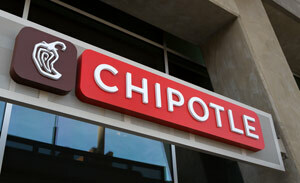 On Friday, the Chipotle stock price bounced back 2% to $513.93 per share, paring its weekly losses in intraday trading. Even though CMG stock is rallying today, the fast-casual chain still faces one major, long-term obstacle… and it's beyond its recent health scare. On Tuesday, three employees were suspected to be infected with the norovirus in Billerica, according to the city's Board of Health. That prompted the fast-casual chain to quickly shut down the store where the sick employees worked. Chipotle cleaned up the restaurant immediately and reopened its Billerica location on Thursday. The closure tested Chipotle's new safety system, which it has been developing since late last year. Local Public Health Director Richard Berube praised Chipotle's cleanup efforts, saying the chain was "very proactive" in responding to the norovirus incident, according to Newsweek. The norovirus scare was the latest in a string of outbreaks Chipotle has had since last year. In December 2015, the restaurant chain wrestled with two E. coli outbreaks that sickened more than 50 people in 10 different states. During the same time, Chipotle faced another separate norovirus outbreak in Boston where at least 136 people fell ill. The CMG stock price dropped 17% in December during the crux of the outbreaks. It has rallied slightly since then, but is still down about 12% since December. Trading at $513.93 per share, CMG stock price is still down 47.6% from its 52-week high of $758.61. After its chain of food-borne illness incidents, Chipotle will have to overcome a huge hurdle in its same-store sales growth. Same-store sales are new sales that come from restaurants that have been open for at least one year. In its latest Q4 earnings report, Chipotle reported same-store sales growth was down 14.6% compared to Q4 2014. It takes a long time for a restaurant's same-store sales to recover from E. coli or viral outbreaks. Money Morning Technical Trading Specialist D.R. Barton made his usual appearance on the FOX Business Network to discuss CMG stock's outlook after its latest norovirus incident. "Companies in the food industry are affected by these things for three to six months," he said. "We're only three months in. This isn't over yet." Consider Jack-in-the-Box in 1993 and Taco Bell in 2006. In 1993, Jack-in-the-Box had 626 people contract E. coli, resulting in the death of four children. In 2006, Taco Bell had 71 cases of customers contracting E. coli. Both of these fast-food chains had their same-store sales drop more than six months after the outbreaks occurred. If Chipotle follows a similar pattern, we'll see its same-store sales fall for several more months. Even with its recent lift, Barton remains bearish on CMG stock price for the short term. In the long term, Barton said CMG stock will be fine, but the company still needs time to fully regain its reputation from its past food safety incidents.